Sharing the close quarters of an inn room with the human female brings out the worst of both of us. I accompanied her to breakfast yesterday. I was hoping she would make me one of those large round breakfasts with the nooks and crannies for butter and syrup (there is an actual law that says inns must have a waffle maker if there is a breakfast buffet). But did she? She did not! She expected me to eat this? 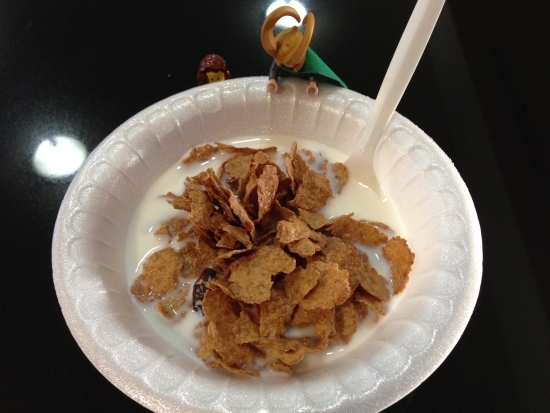 It’s cold outdoors now, and she gave me cereal! And it wasn’t even the sort with the colorful cardboard marshmallows! Even Sigyn was put off. Human 1, Loki 0. 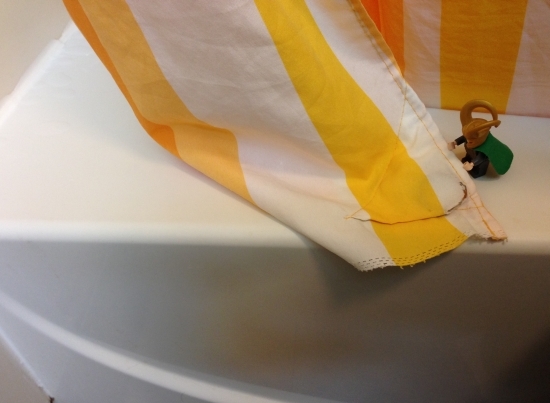 Such provocation cannot go unanswered, so while she was showering, I untucked the curtain. Water everywhere! Tie score 1-1. Then I hid all day, when she wanted to take photographs. Human 1-Loki 2. Hah! This morning, she did want to make herself a nook-filled breakfast, but I cast an invisibility spell on the Texas-shaped waffle maker and she didn’t notice it until she had poured the batter into the round griddle mechanism. Human 1-Loki 3. Augh! She does this on purpose, I’m sure of it! Just look at this monstrosity! This sort of breakfast is meant to be tidy and precise. Just LOOK at these sticky-uppy bits! Oh, it drives me insane! Sigyn, how does this not bother you? Grr. Human 2-Loki 3. Just for that, I am hiding one of her gloves. It will vanish in the car between one moment and the next and she will spend the next 100 miles looking for it. Human 2-Loki 4. Game and match to Loki! Same little cake by the sink. 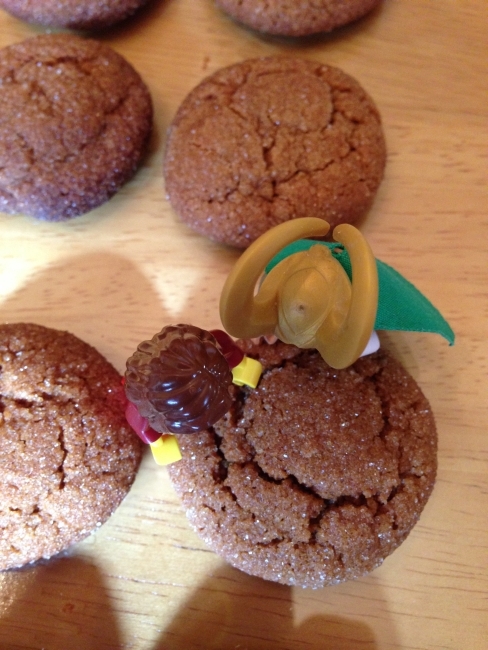 Sigyn, STOP! We have been over this and over this. 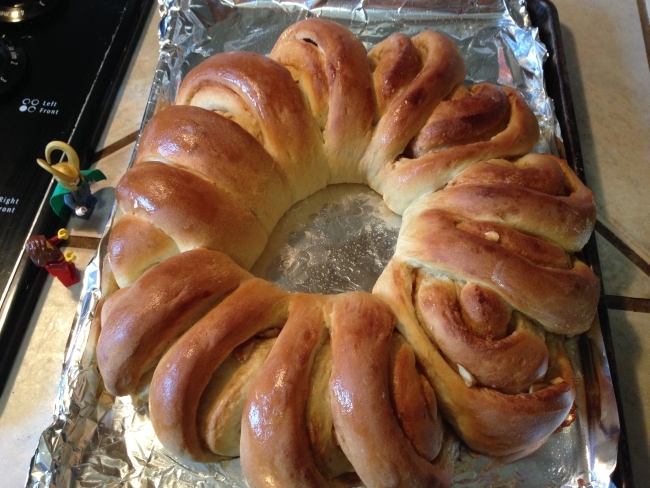 Yes, it looks and smells delicious. 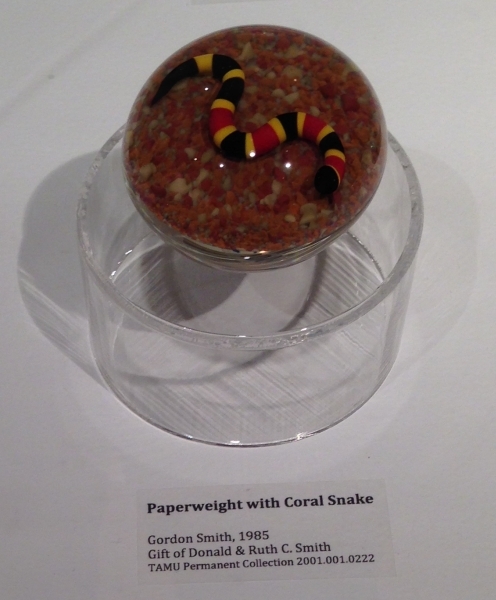 Yes, it is called a “cake,” but no, it is not actually cake. You cannot eat it. Just let the “cake” be, dearest. I will magic us up some proper treats later. Promise. * Did I really just write that? 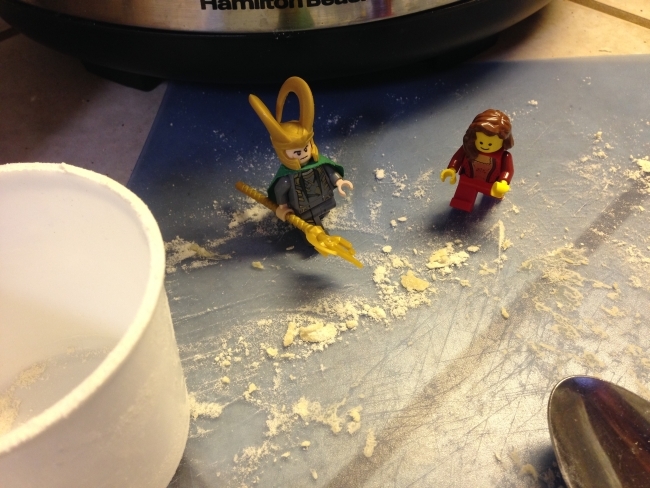 It is possible that Sigyn and I have spent too much time watching the food channels on the humans’ television device. I shall have to desist. 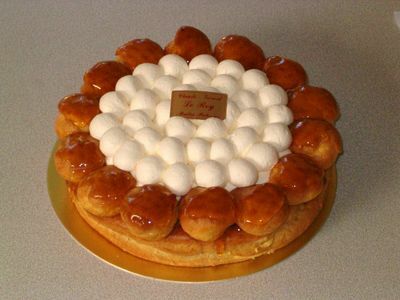 Such intimate knowledge of…of pastry is not befitting the god-ruler of this realm — or any other. 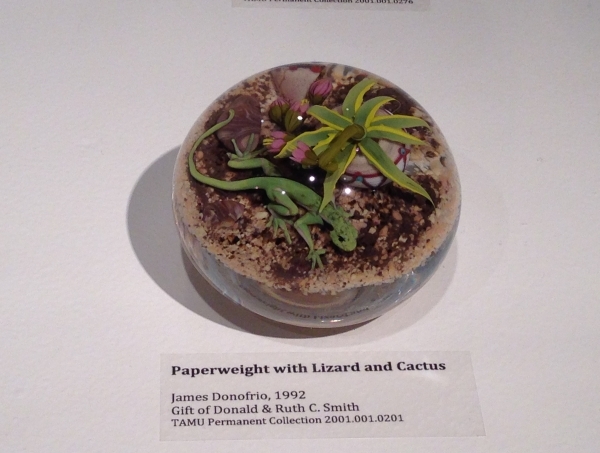 The Gift of Glass, Part III: If You Had To Choose…? Fandral’s mustache wax! There is another whole room full of glass today. 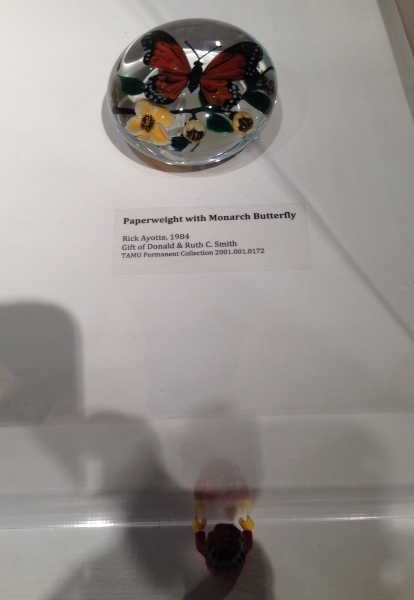 These pieces have colored glass drizzled over the clear. But wait! 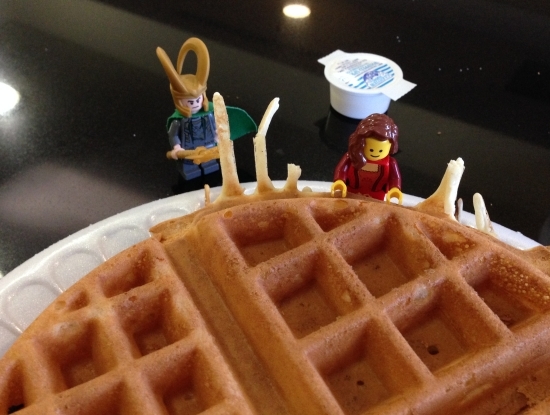 Sigyn, look over there! 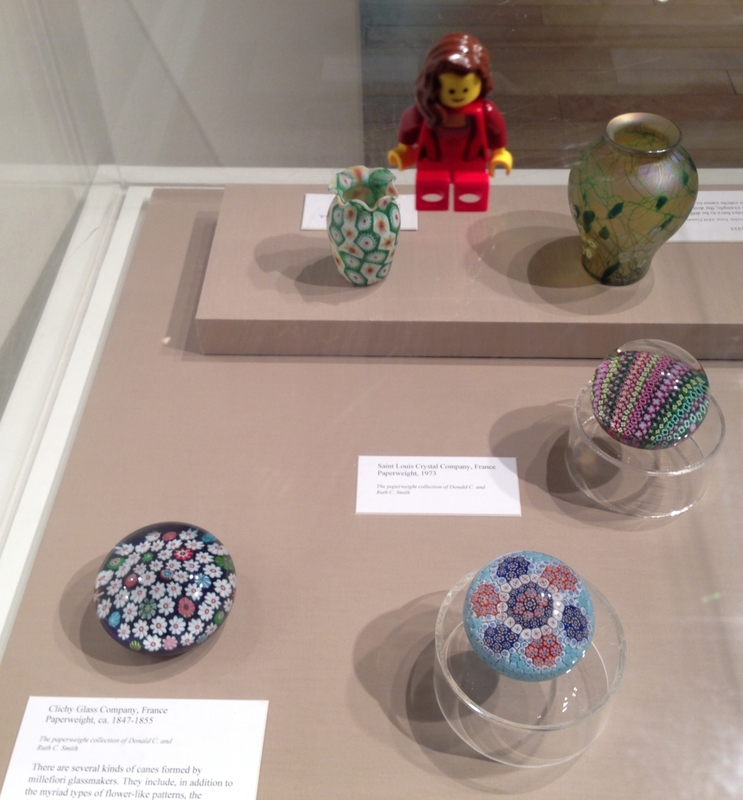 There are some teeny tiny vases and some paperweights! The ones with flowers are always your favorites, right? 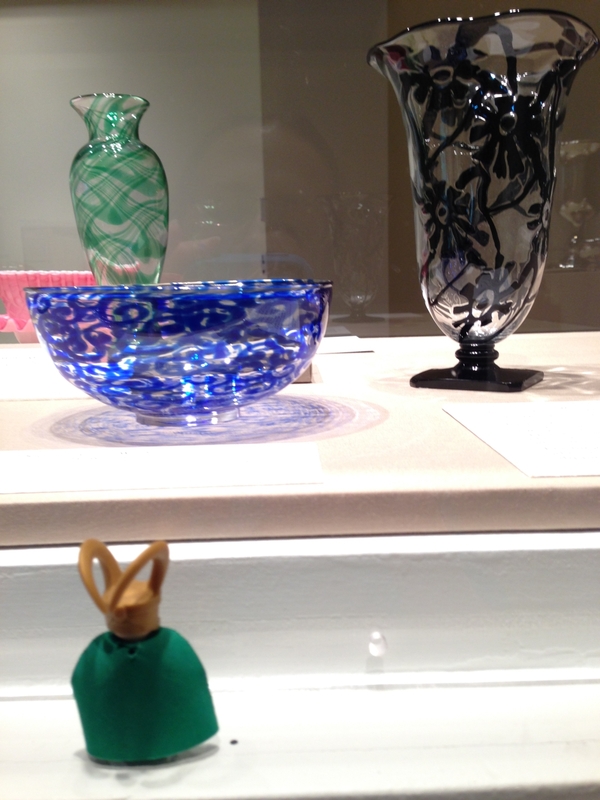 Note that Sigyn has parked herself on top of the case, the better to gaze down at these vitreous gardens. Um, dearest, I think the guard is becoming antsy. Do climb down and come look at the others. Sigyn is enthralled by this lepidopteran marvel. It reminds me of this year’s Halloween costume. No, wait! This one is my favorite. Which piece do you like best, Sigyn? Interesting. I would have figured the butterfly for sure, because a) butterfly and b) red(dish), but she’s chosen the lizard because it has flowers and green plants and an animal. 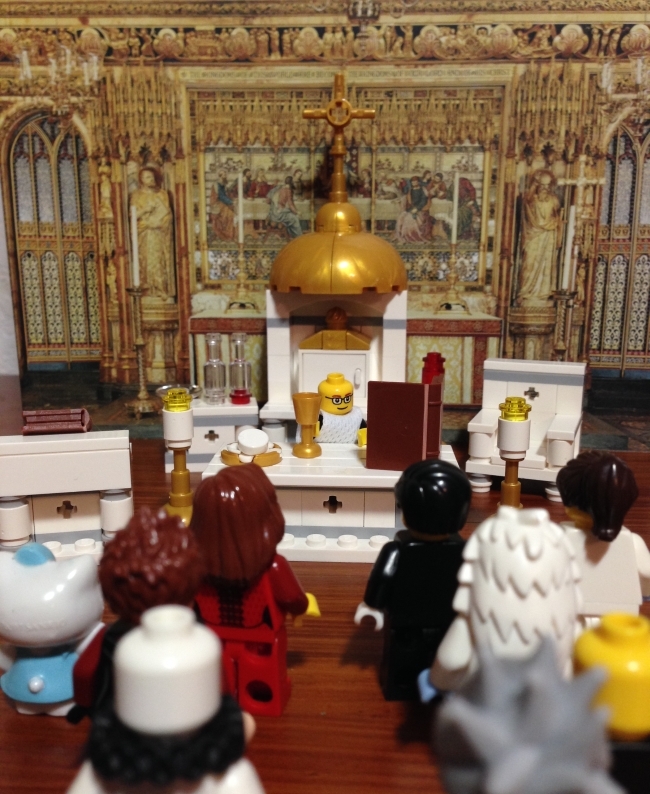 I agree–it’s a splendid bit of workmanship. Next time the guard is distracted, I shall smuggle it out. 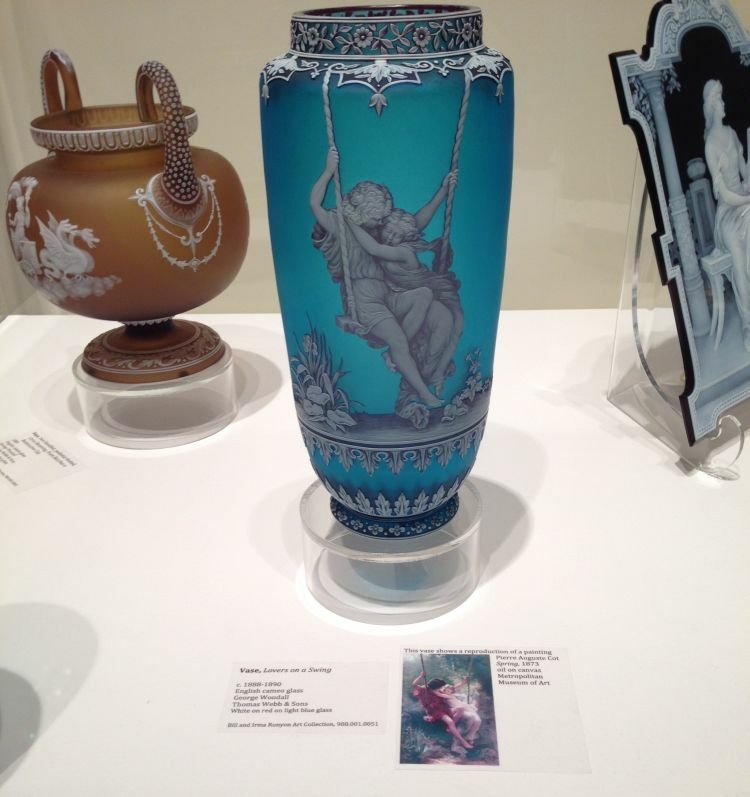 The glass collection is notable for including a good number of cameo glass pieces. Talk about fiddly! 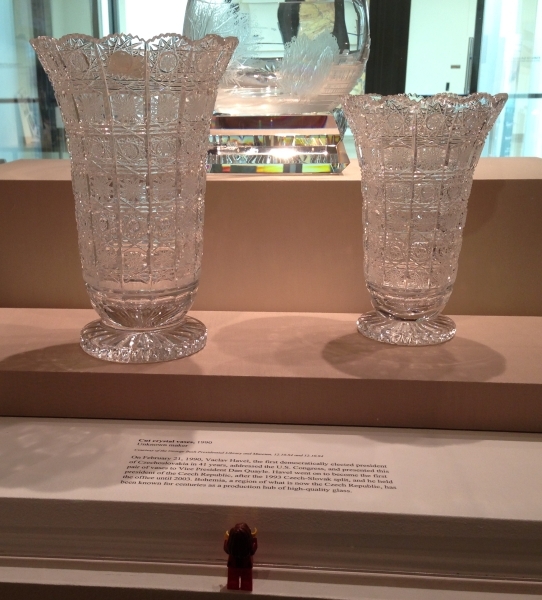 These are made by layering different colors of glass and then carving the top layer away. For a species with such short lives, humans seem to be willing to spend huge chunks of their allotted spans working on items that have no practical purpose. 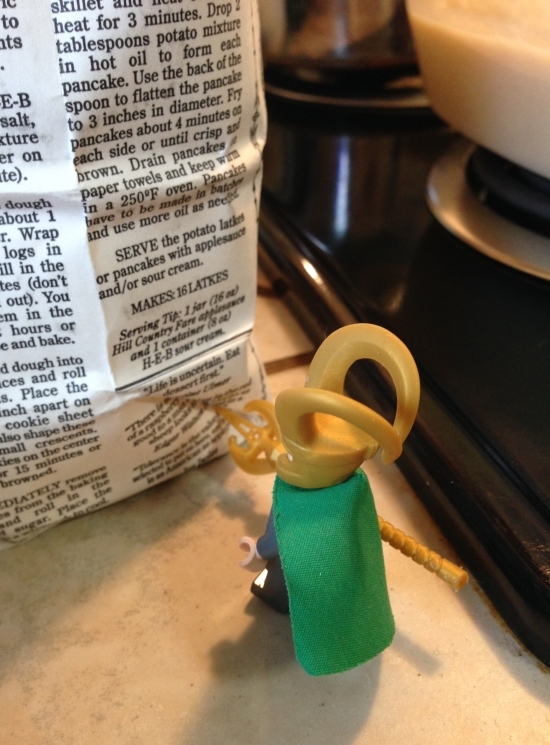 I don’t know about Sigyn, but I know I would never have the patience to do this. but working on curves must be very difficult. Sigyn wishes she could get a little closer. 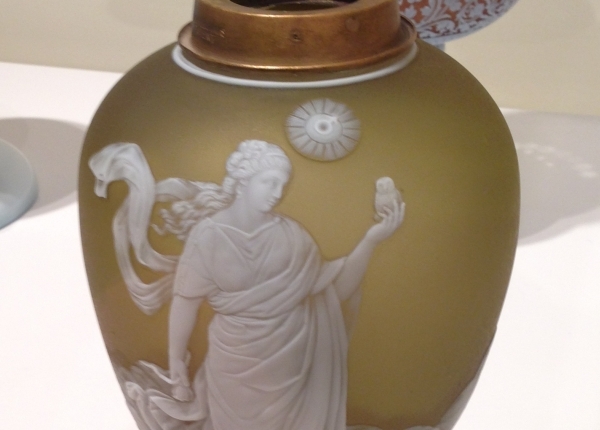 I shouldn’t magic her inside the case, but I can make the vase easier to see. Magnify! 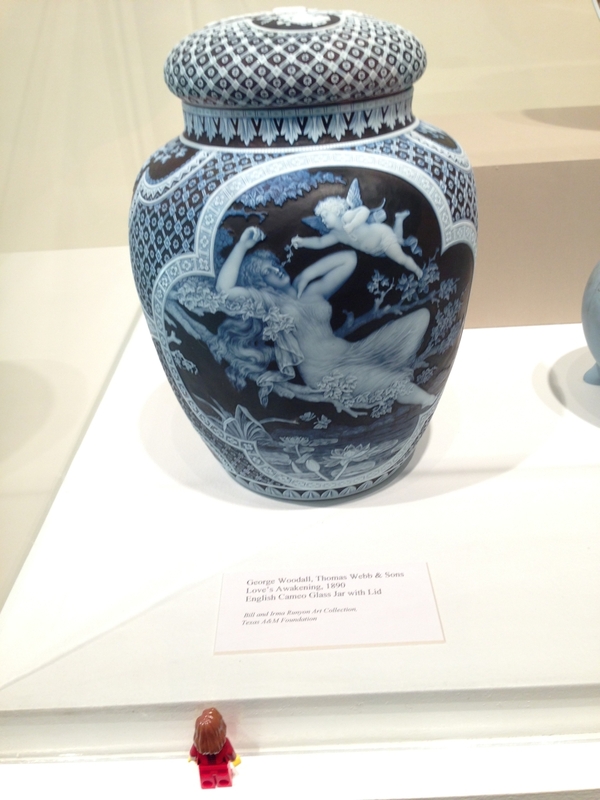 Some of the vessels seem to be depicting stories, which aren’t always on the cards. 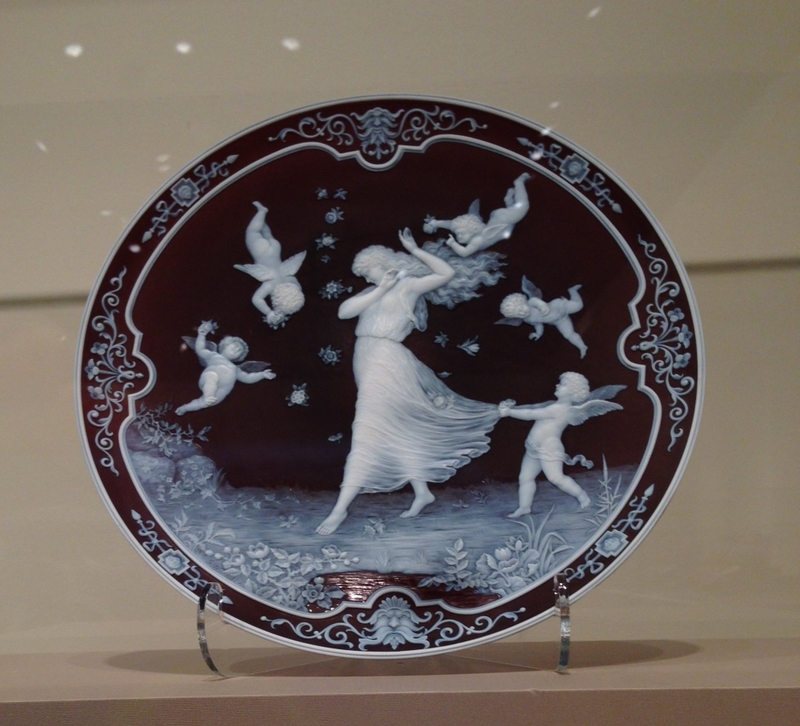 For example, why is the flying baby poking the floppy lady with a twig? 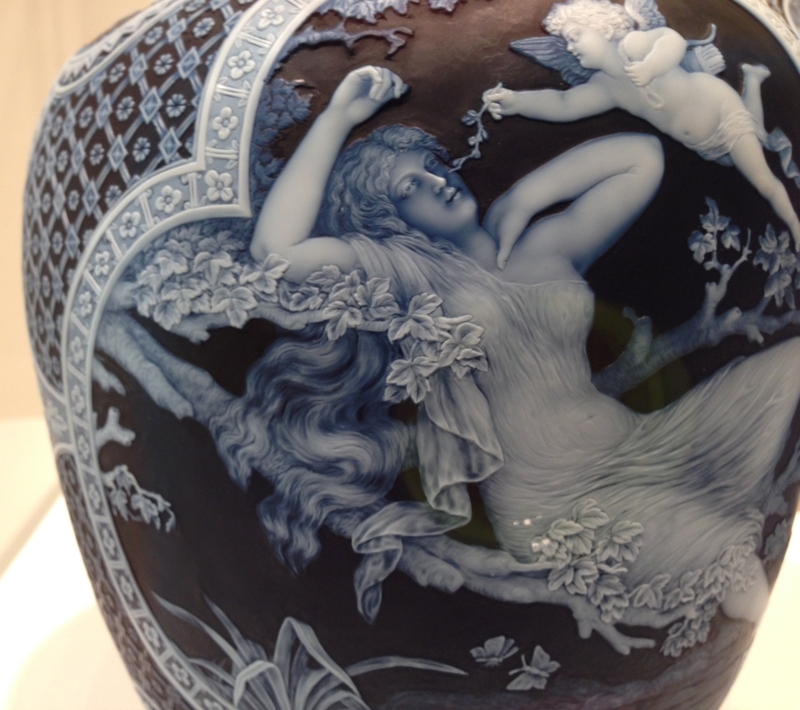 Sigyn likes the cute little owl on this vase, while I am more interested in the serpent on its foot. 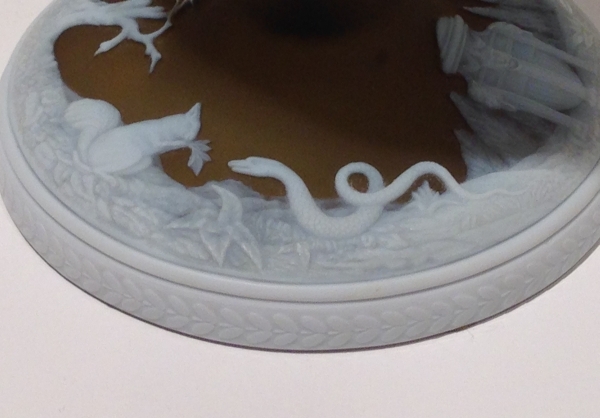 Watch out, little glass squirrel–that snake cannot be distracted by waving bits of vegetation! 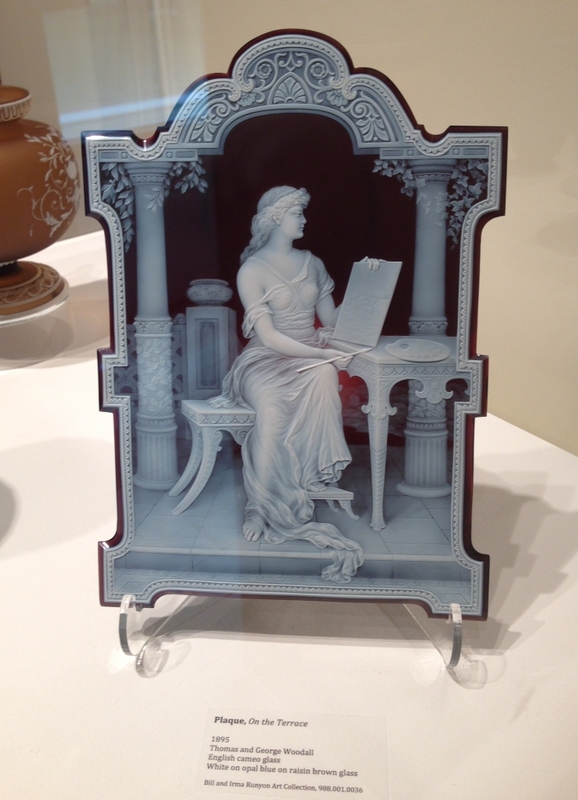 Sigyn says she thinks maybe this one has three layers, with some dark blue between the white and the turquoise. 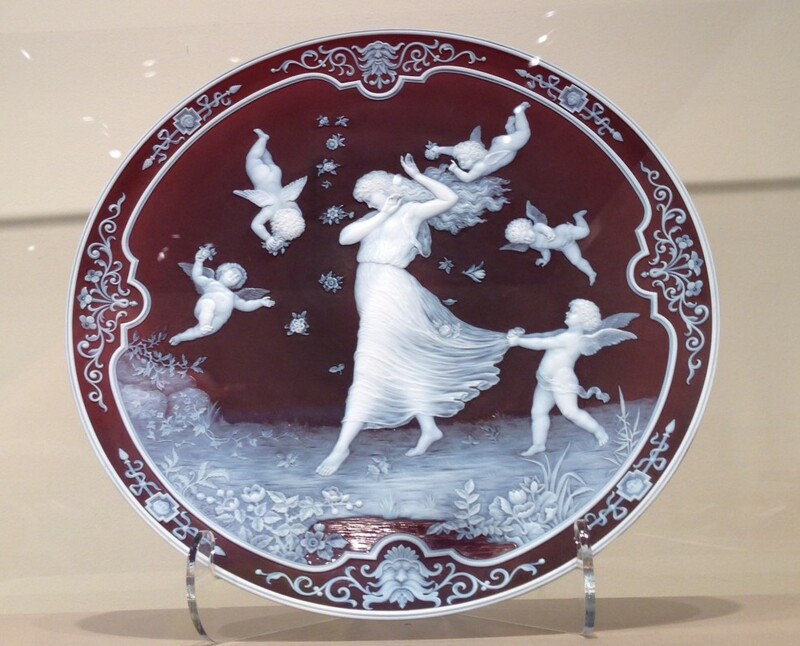 After looking at all the pieces, she’s decided this is the most beautiful piece on display, and I wouldn’t say she’s wrong. It could only be more beautiful if it were red. 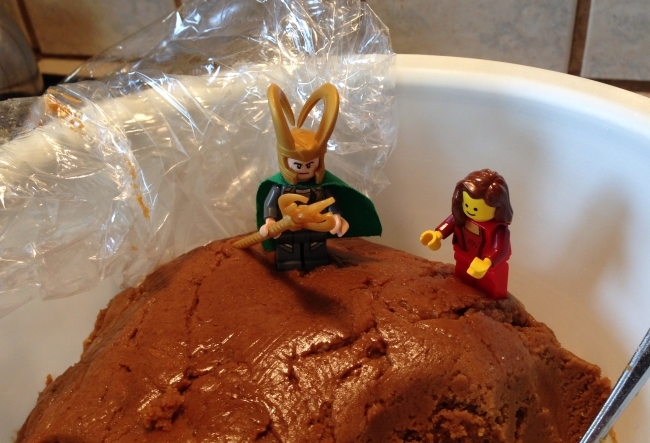 This year, the human female decided to inflict upon some friends and coworkers that insidious Midgardian entity known alternatively as Hermann or Amish Friendship Bread. Or as I like to call it, the Yeast Beast. The starter is revolting. This must be a joke. It has been frothing and bubbling on the counter for ten days, stirred and “fed” regularly and giving off miasmic whiffs of alcohol. Surely no good can come from this! 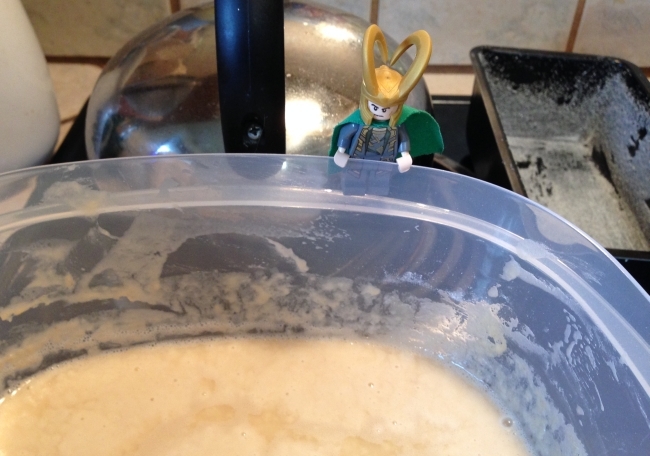 Today we are baking. Out come the the sugar and flour and oil and cinnamon and vanilla. While the human female is stirring and covering every inch of the kitchen with gooey batter, I think I’ll just poke a little hole in the flour bag. That slow leak should provide amusement well into the new year! Oh, no! 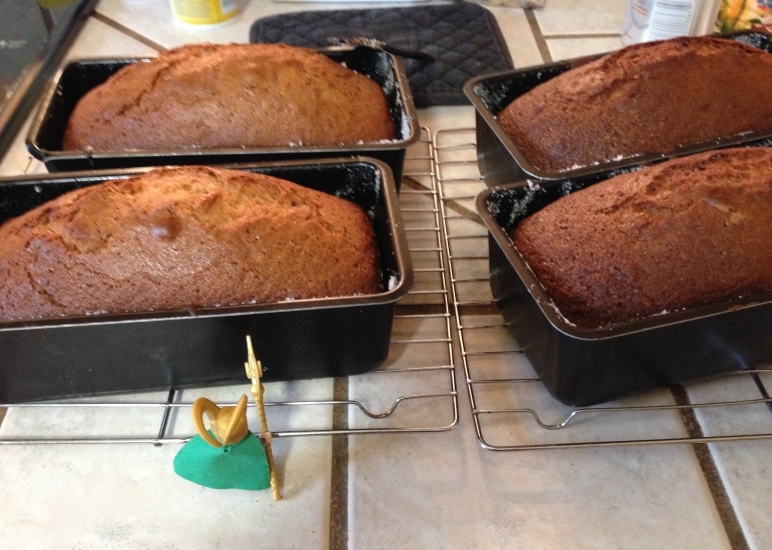 This baking process has generated multiple baby containers of starter! They’ll be burping and fermenting and taking over kitchens all over town before you know it! Quick! Stop the madness! Cook it all before we’re outnumbered! Well. I would not have believed that anything remotely edible could result from that nasty starter and all of that goopy batter. I’m not allowed to gouge out a taste, but the finished product smells pretty good! Guess the human female can’t screw up everything all the time! Oh, now wait–what’s this? She’s made up a whole bowlful of something sticky and brown. 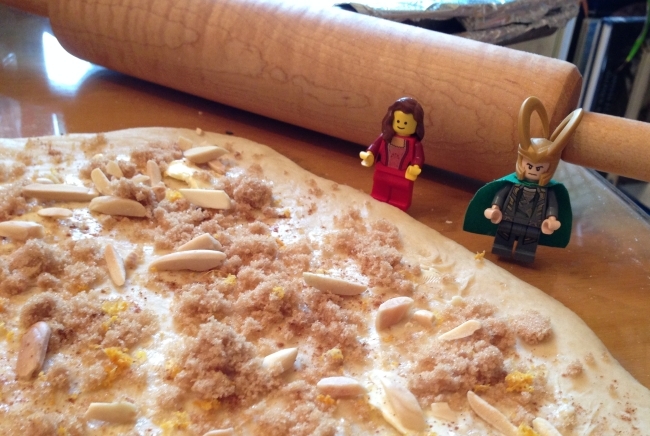 I heard her talking about making the human male’s favorite… Sigyn, do you suppose this is the larval stage of gingerbread? I do believe it is! 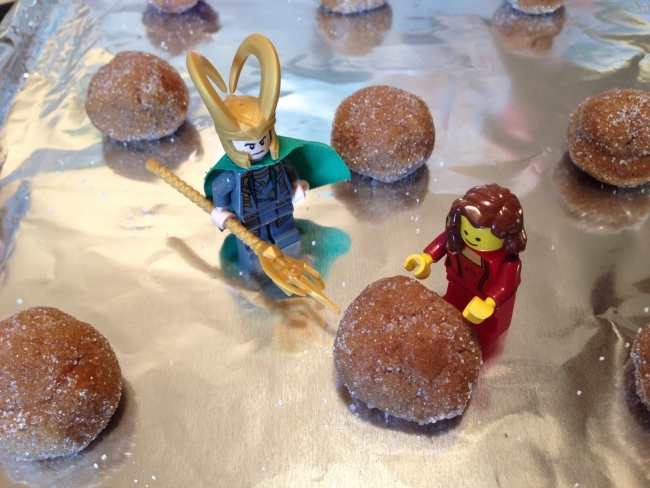 Sigyn is enjoying helping roll the little balls of dough. I prefer not to get my hands dirty. However, I have no scruples about sampling the finished product. All in the name of quality control, of course. 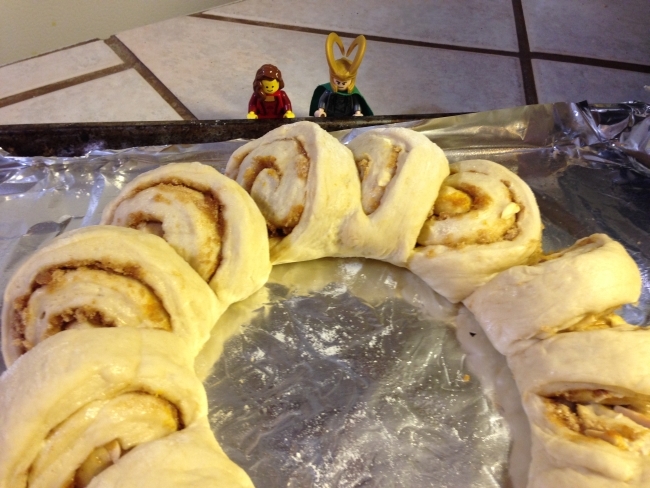 By Volstagg’s monstrous belly! She’s not done yet?! She’s setting up to do something else. How many carbohydrates does one household need? 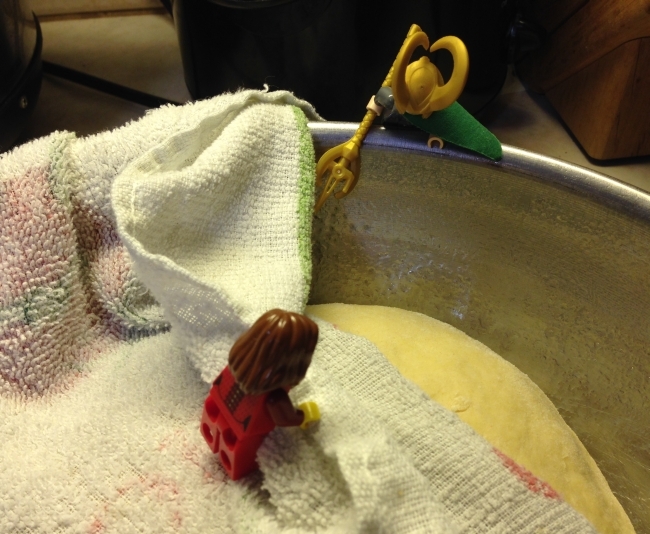 Sigyn is shushing me, saying the dough needs its rest. Naptime, Doughball! Sleep and grow fat. Well, the dough has risen obediently and been smacked down for its trouble, and now the human female is making… something long and flat, apparently. Brown sugar, cinnamon, almonds, and orange peel. Either this is the most unusual pizza ever, or we’re not done here yet. All right. That makes more sense. It’s a breakfasty-ring thing. Very fancy! But we can’t eat it raw! That’s more like it! Drizzle on some almond glaze and we feast like kings! 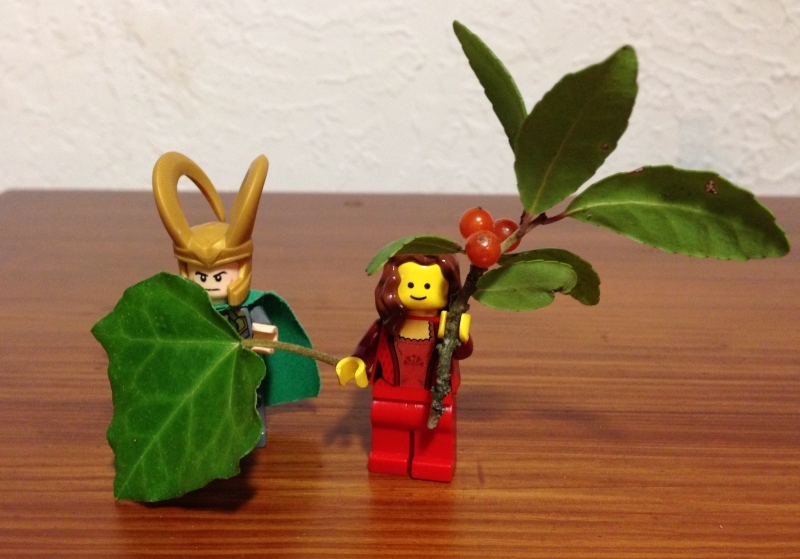 Happy Yule from Loki and Sigyn! All the preparations are done. Well, mostly. Don’t look too closely at the corners, because the human female missed some bits of sweeping, and there will be paperwork and bills and yardwork for the days after Yule (the human female pushed a dead tree over and now has to cut it up), but by and large, the humans are ready for their big holiday. Time to pause, and rest, and consider. 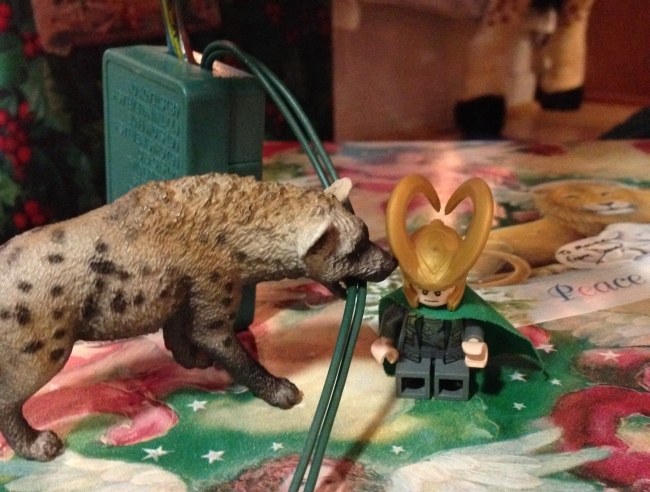 There’s still so much I don’t understand about Midgard, and about my place in it. And I suspect that, as a Jotun, I’m missing out on some of the significance of this holiday. There’s another aspect to it, something beyond gift wrapping and extra calories. …while I’m here alone, shaking packages and hoping Fisi doesn’t short out the tree lights and burn the house down. “Peace.” It’s a wonderful idea, and I know I should want it, at least for Sigyn, if not for myself. I guess it’s just not in my nature.